The Bighorn Mountains are our favorite part of the community because it’s one of the only places we’ve visited so far. Looking forward to visiting lots of other places! Photo provide by Angela Parker, AICP. Meet Angela Parker, AICP, CFM, who most recently served as president of the Western Planning Resources board which publishes the Western Planner. She has worked GIS projects in the areas Fairbanks North Star Borough, Alaska. Today she is the Land Planner/GIS Manager for Big Horn County, Wyoming. 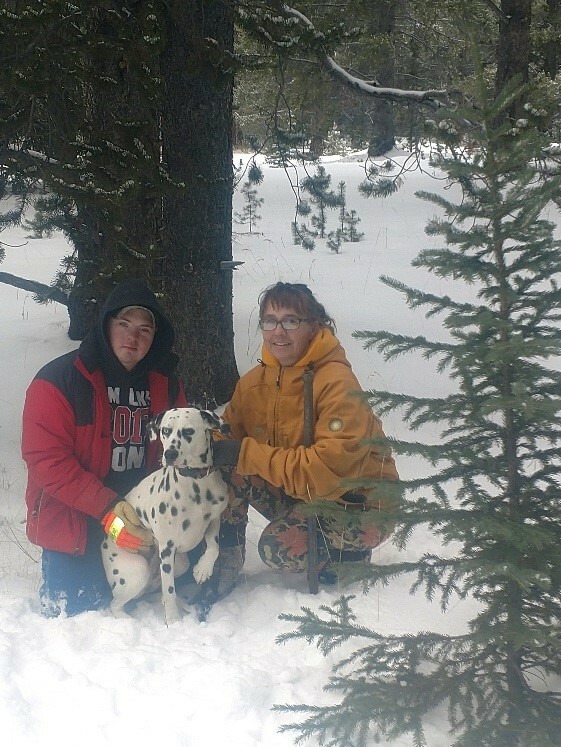 Our son Stanton, dog Pepper, and Angela Parker picking out a Christmas tree in the Bighorn Mountains 2018. Photo courtesy of her husband, Steve Parker. I am currently the Land Planner/GIS Manager for Big Horn County, WY. I have been here for four months and am loving it! My projects include updating our subdivision regulations, working with 9-1-1 data, online mapping and working with the public on their development applications. How did you get into the planning profession? I got into the planning profession completely by accident. When my youngest son was in first grade, I started looking for work to help supplement the family income. I went to apply for a position in the Assessor’s office in Gila County, AZ, and they told me about an open position in Community Development for a Building Safety Assistant. I was surprised when they hired me, but loved the work. From there I became Office Manager, and then took on extra duties, including those of the part-time Planner when he retired. Describe your planning background and education. I have a Bachelor of General Studies (BGS) with a Business Administration emphasis from Brigham Young University; and a Master of Administration, Land Use Planning emphasis, GIS track from Northern Arizona University. I didn’t even know planning existed until I started working at Gila County Community Development. I took on the planner’s duties in 2008, passed my AICP exam in 2010 and have been working in planning ever since. Describe your favorite planning project. 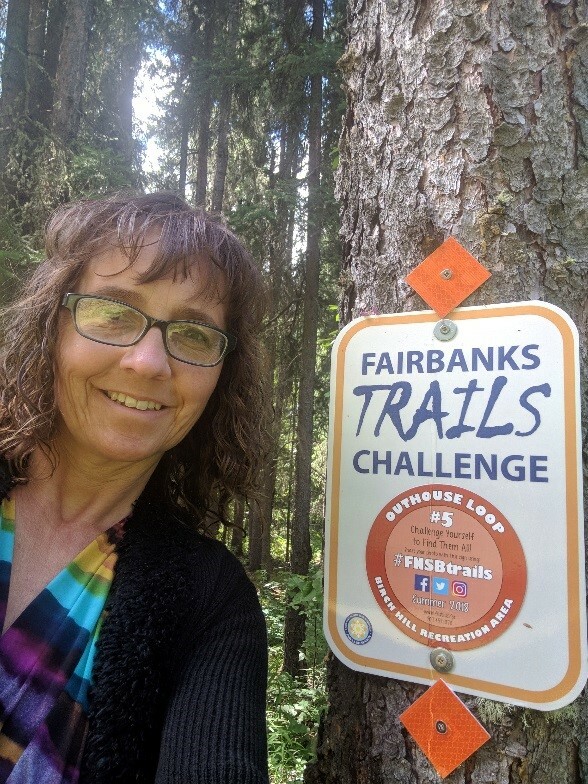 Angela Parker participating in the Trails challenge Fairbanks, AK 2018. Photo courtesy of Angela Parker. My favorite planning project was the GPS control project we did in Fairbanks North Star Borough, Alaska. I wrote an article about it that was published in the Western Planner in January 2017. It was my favorite project because I got to play on the computer and call it work. My role was researching existing monuments and deciding which ones would be most likely to be found out in the field for the technician to gather coordinates on. I used subdivision plats and aerial photography/contour maps to determine the most likely locations. I plotted the points on the GIS and printed the maps for the technician. I even got to go out in the field with her a couple of times. Why do you belong to the Western Planner? I belong to the Western Planner because I value the connections I get with other planners who face similar situations as me. Western Planner gives me insights and ideas to use in my job and helps me to increase my knowledge and share my ideas as well. Describe the biggest obstacle you had to overcome in planning or life. I guess my biggest obstacle was public speaking. I never thought of myself as very outgoing, but since becoming a planner I have become more outspoken and I enjoy presenting cases to commissions and the public. Toastmasters was a big influence in helping me become a better speaker. I am known for being a bit of a “rebel” planner because I like the type of zoning that is least restrictive (like no setbacks; better yet no zoning at all!) and I feel that a community can still be a great place to live without zoning.